The purpose of the January 18th Building Committee (the �Committee�) fourth informational session was to share with the community deficiencies with our current police and fire department buildings and Town Hall; review concept drawings and renderings for new public safety and administrative facilities on town-owned land; discuss project cost and property tax implications; and answer questions and seek feedback from attendees. Questions and comments presented during the informational session are paraphrased and highlighted in red, underlined and italicized in these minutes. Sign-in sheets were provided for those interested in providing their contact information. About 35 people attended the session. The session was opened at 7:05 p.m. by Imre Szauter and was recorded. The session began with a welcome to all attendees and an invitation to rise for recitation of The Pledge of Allegiance. Imre Szauter stated that previous informational sessions had been held during 2017 on January 31st, June 22nd, and September 28th. Imre Szauter mentioned the sign-in sheets that were being routed around had two checkboxes on them for those interested in touring the Franconia Public Safety building with Project Manager Allan Clark on either Thursday, January 25th at 9:00 a.m. or Saturday, January 27th at 9:00 a.m.
Attendees were encouraged to ask questions and offer comments during the presentation, and were reminded that time had been reserved at the end of the presentation for additional questions and discussion. Imre Szauter introduced Project Manager Allan Clark and invited him to provide a review of the Committee�s process. Allan Clark provided a brief background on his role as project manager for Phase One of the Committee�s work. He stated he is the Sugar Hill fire chief and president of a real estate development company that has completed nearly one-half billion dollars� worth of projects, including municipal buildings. Allan Clark highlighted some of the features of the Franconia Public Safety building that might be of interest to residents and mentioned the January 25th and January 27th tours as a way for residents to learn more about energy-efficient, low maintenance municipal safety buildings. Allan Clark provided a review of the process the Committee followed to arrive at its recommendation for the project. He outlined the Committee�s goal, which was to present to the Select Board a recommendation for conceptual plans and a budget that would lead to development of a warrant article for consideration during the February 6th First (Deliberative) Session and the March 13th Second (Town Vote) Session. Allan Clark reviewed the components that made up Phase One, including interviews with department heads and town employees for use in developing detailed preliminary specifications; careful review of the 13 acre town-owned parcel of land adjacent to the current Town Hall; hiring an architect to translate the preliminary specifications into conceptual drawings, floor plans, and renderings; and develop a project budget based on information from several reputable construction managers. Allan Clark offered that Phase Two is dependent on voter approval March 13th. If the warrant article is approved and he is hired as the project manager for the construction phase, he said he would develop a detailed RFP (Request for Proposal) for submission to several construction management firms; work with the Committee to interview construction management firms and recommend the hiring of one construction manager to follow a design-build process; finalize design specifications; develop a cost plus contract with a guaranteed maximum price; closely monitor the construction, budget and schedule; and meet weekly with a Committee representative and the construction manager to exchange information and keep the Select Board and town residents apprised of progress. Imre Szauter introduced Police Chief John Trammell and requested that he step attendees through a series of police department building photographs to highlight current deficiencies. John Trammell stated the police department has occupied this leased facility for ten years and that it does not meet current standards for a secure law enforcement facility. He presented a view of the entrance, highlighting the suspect holding area and records storage cabinets. John Trammell discussed the inadequate holding cell, noting the lack of a toilet and sink, and stated that juveniles may not be placed in this cell. This leads to significant issues whenever a juvenile is brought to the police station, as the juvenile must be separated from any other persons in custody. He pointed out several evidence locker deficiencies and noted the locker is too small to hold the materials they need to retain. John Trammell used three photographs to point out many of the office area deficiencies, including no separation or privacy between officer desks. The inadequate garage area and lack of perimeter security were highlighted in additional photographs. John Trammell concluded his presentation by opening the floor for questions. Question: How long do you hold a suspect or what steps do you take to transfer a suspect to another facility? John Trammell responded that the police department doesn�t hold suspects for long; they are transported to the facility in Stewartstown, a 72 mile drive. If a suspect is required to be in court the next day, the Sheriff�s department will arrange transportation to Lancaster from Stewartstown and the Carroll Police Department officer will meet them there. Question: Does the proposed police department have a sally port? John Trammell responded that the new police department facility would have a two-vehicle sally port with an adjacent processing and holding area for adults, and a separate juvenile holding area. He explained how a sally port provides additional security for officers and the public. Imre Szauter introduced Fire Chief Jeremy Oleson and requested that he step attendees through a series of fire department building photographs to highlight current deficiencies. Jeremy Oleson started his review by stating that the current fire department building has five apparatus bays that support two ambulances, two engines, and one rescue truck. There is a forestry truck parked behind the fire department building. Jeremy Oleson noted that the size of the apparatus bays is inadequate to accommodate standard model engines, so custom-sized engines at greater expense must be purchased by the fire department. He also stated that maintenance of all vehicles, especially cleaning operations, are hampered by not having enough space in front, behind and on both sides of the vehicles to maneuver personnel and equipment. Jeremy Oleson noted that continued development and existing structures greater than two-stories in height in the Bretton Woods community may require acquisition of an aerial fire truck, but the current fire department building would not be able to house one. Jeremy Oleson pointed out that turnout gear is stored on the rear wall, behind the vehicles. He pointed out that clean turnout gear should be stored in a separate area, away from the vehicles and with adequate space for personnel to gear up quickly during a call for service. Question: Where do firefighters gear up before a run? Jeremy Oleson stated that firefighters gear up along the rear wall, behind the vehicles. He noted that when the vehicles are cleaned, the turnout gear ends up getting wet again because it is stored so close to the vehicles. Question: How much extra time does it take firefighters to gear up in that space? Jeremy Oleson stated that personnel gear up as best they can in the space they have available. He noted that minutes matter in an emergency, so firefighters and rescuers gearing up and leaving the fire department building more quickly reduces their overall response time. Question: Where are the air tanks stored? Jeremy Oleson stated that all SCBAs (Self Contained Breathing Apparatus) remain on the vehicles and that the cascade refilling system is located inside the building. Question: Is the cascade system recharged by an outside agency? Jeremy Oleson stated that there is a compressor in the building for recharging the cascade system. Question: Will the cascade system and the compressor be moved to the new facility? Jeremy Oleson stated that the compressor and the cascade system have been properly maintained and are in good shape, so they could be moved unless there were other issues preventing their reuse. Jeremy Oleson noted one significant deficiency that exists today is the lack of a decontamination area for personnel to clean their gear and themselves when they return from a call. The nature of biohazards and burning materials has changed over the years, where today firefighters and rescue personnel are exposed to more toxic agents than ever before. Having a separate and secure area to wash their gear and store it properly reduces their exposure to toxins and increases the service life of their gear. In addition, being able to removed dirty clothing, shower, and dress in clean clothes further reduces their exposure and protects their personal vehicles, homes and families from toxins that otherwise might cause illness or disease. Question: Where do firefighters currently decontaminate themselves? Jeremy Oleson stated that the only options today for personnel decontamination are either outside in front of the building or inside an apparatus bay during inclement weather. There is no shower facility in the current building. Question: Does the fire department have any female personnel? Jeremy Oleson stated that there is one female on the EMS side. Question: Does having a female in the department require separate decontamination areas in the new facility? Jeremy Oleson stated that he didn�t believe there is a requirement for separate facilities, but he�s certain accommodations can be made for such a situation. Question: Would it be possible to construct a dedicated wash bay for vehicles in the current building so the cleaning operations could be separated from vehicle storage? Jeremy Oleson stated that there is very little room on the current one-half acre site for any expansion, and doing so would further strain the old heating system and aging structure. Jeremy Oleson pointed out the deterioration of the cinder block walls both inside and outside the building, with large cracks in the mortar between the blocks and the blocks themselves crumbling. He also noted numerous leaks in the roof have damaged the interior ceiling and reduced the effectiveness of the insulation. Jeremy Oleson noted the kitchen does not have a ventilation system above the stove, so fumes accumulate whenever the facility is used. Question: How many full time personnel are there today? Jeremy Oleson replied that there are two full time personnel and about fifteen call members in the department. Jeremy Oleson noted the photograph of the small office of the deputy chief EMS and stated it is also used for storage by the Fire Auxiliary. He stated that the Fire Auxiliary is a vital part of the department, as its fundraisers assist the department with acquisition of much-needed equipment at no cost to the taxpayers. Jeremy Oleson pointed out that fire department personnel and town employees routinely work on the building to make the best of the situation they are in, especially when it comes to providing extra space on the second floor above the training room. He noted the heating systems at the rear of the building are aging and use large quantities of heating oil during cold months to try to maintain a steady temperature inside the office and apparatus bay areas. Question: How old are the heating systems in the building? George Brodeur, one of the attendees, stated that he installed them in 1983. Comment: The current fire department building was originally shared by the police and fire departments. About ten years ago, repairs to the building were required because the leaking roof had damaged the ceiling in the area occupied by the police department. Insurance funds paid for the repairs, and it was anticipated the repairs would extend the building�s life by another ten years. That time is up. Question: Does the town have an adequate emergency shelter? Jeremy Oleson stated that the town does not have any officially designated emergency shelter in a town building. Comment/Question: Earlier in the meeting you mentioned the town might seek grants for an aerial fire truck. Will the proposed new facility be able to house such a vehicle? Jeremy Oleson stated that the conceptual drawings show the apparatus bay at over 100 feet long, and with the typical aerial fire truck at 45 to 50 feet, there would be room to properly house one in the new public safety building. Question: Without a proper facility to store an aerial fire truck, would the town even be eligible to apply for such a grant? Jeremy Oleson replied that the town would not meet eligibility requirements for a grant without an appropriate facility to house such an expensive piece of equipment. He also stated that, in his opinion, expanding the current fire department building to house an aerial fire truck is not an option. Question: Would a grant cover the entire cost of an aerial fire truck? Jeremy Oleson stated that it is possible enough grant funds could be secured to cover the entire cost, but it is too early to begin exploring that option without a proper building to store the unit. Question: How many structures in town would benefit from having an aerial fire truck? Jeremy Oleson responded that any structure that is over two stories would be better served by an aerial fire truck, as such a unit would reduce the risk to firefighters trying to reach high places and likely make victim rescues quicker and safer for all. Any structure with a metal roof would be easier and safer to access, especially in the winter months. In the Bretton Woods community, the Mount Washington Hotel and any condo or building over two stories would be candidates for using an aerial fire truck. In addition, an aerial fire truck can be used to reach difficult or otherwise inaccessible areas, such as effecting river rescues. Imre Szauter introduced Emergency Management Director (EMD) John Gardiner and asked that he address the Emergency Operations Center (EOC). John Gardiner opened his presentation by stating he doesn�t have an office within the fire department building for storage of his EMD materials and currently uses space in his personal garage to store them. He displayed the fire department training room photograph and commented that the space doubles as the EOC. However, that space lacks security and should be isolated during an emergency to allow personnel to focus on their job responsibilities. John Gardiner reminded attendees that the town does not have an officially designated emergency shelter in any of its buildings. There is a Memorandum of Understanding (MOU) with the Mount Washington Hotel to house town residents during a declared emergency, subject to availability of space and access. He pointed out that during the October 2017 storm, access to the Mount Washington Resort was cut as the river rose over their access road. John Gardiner stated that another issue during an emergency is residents refusing to leave their homes without their pets. Consideration should be given to providing safe accommodations for a limited number of domestic animals, perhaps in the context of a day shelter. John Gardiner pointed to an old photograph of the Town Hall next to the two-bay fire department building and stated that the building housed town offices, the post office, and a gymnasium on the second floor. He mentioned the small fire department building has been modified, added to, and repurposed several times since that circa 1968 photo was taken. It housed the police department until about 1969, at which time it was moved to the second floor of the current Town Hall. John Gardiner commented on a second old photograph (circa 1969) that showed the current US 3 and US 302 intersection under construction. He pointed out several buildings and features that no longer exist, and provided a brief history of the area since completion of that project. Imre Szauter introduced Selectman David Scalley and invited him to step attendees through a series of Town Hall photographs to highlight current deficiencies. David Scalley reminded attendees that the town has seen many changes over the years, as evidenced by the photographs just presented by John Gardiner. He also reminded attendees that the current Town Hall, where tonight�s meeting was taking place, is a repurposed school building completed in 1895. David Scalley pointed out that based on a letter from the State Fire Marshal, the Select Board decided in December 2016 to close the gymnasium portion of Town Hall to the public. The heating system was modified to remove the two zones that heated the gymnasium, significantly reducing the building�s fuel oil use during the past year. David Scalley reviewed the photographs that showed the basement restroom facilities and mentioned that town employees did the best they could to make that area functional. Because the restroom is not handicapped accessible, it isn�t used on a regular basis. A door on the north side of the restroom provides access to the boiler room and the basement records storage area, shown in two separate photographs. George Brodeur stated that he installed the boiler in 1984. Both of those spaces suffer from numerous problems, including code noncompliance and life-safety issues. David Scalley commented on the second floor records storage photograph, noting the unconditioned air environment was not conducive to proper records storage. The second floor area is closed to the public and is considered hazardous to town employees. Together with the closed gymnasium, the second floor of Town Hall represents considerable wasted space that burdens town residents with maintenance and operational costs. David Scalley pointed out second floor storage area for the Historical Society in another photograph, noting that materials in that room should be either on display or available for study, as town history should be readily viewable by all. The new facility would provide space for such displays and opportunities for study of these materials. A photograph of the public meeting space, where the informational session was being held, serves other functions such as food pantry, kitchenette, planning and board of adjustments office, treasurer�s office, and town voting activities. David Scalley pointed out it is too small for many of these activities and the transition between the meeting space and the other town offices makes the space non-ADA compliant. Question: Does the town owe anything on its buildings? Question: Is the Town Hall addition separating from the original Town Hall structure? David Scalley replied that he believes the visible separation is caused by the original Town Hall building settling rather than by movement of the addition. Comment: One of the visible cracks in the structure is growing, as someone placed a nickel in it a few months ago and that nickel has recently fallen out. David Scalley commented that the buildings we have today have served us well and town employees have done a good job keeping them functional, but the time has arrived to build new energy-efficient, low-maintenance facilities not just for us, but for our children and grandchildren. We should not expect these aging buildings to serve current and future needs without a significant expense to taxpayers, as fire- and life-safety code violation corrections will only buy the town a few additional years of service. We should be thinking many years into the future by designing, constructing and equipping modern facilities today. David Scalley summarized his thoughts by stating that moving ahead with new facilities should cost residents less in the long run, as excessive maintenance and operational inefficiencies will only result in delaying the inevitable higher costs of project materials and financing. Question: If the new project moves forward, what is the plan for the current Town Hall? David Scalley replied that the town�s resident own the building and the decision on its fate should be between them and the Select Board. If a private entity can bring a plan to repurpose the Town Hall building, it should be reviewed by the Select Board and town residents for consideration. Question: What happens if the Town Hall isn�t sold and repurposed by a private entity? David Scalley responded that the Select Board would consider shuttering the building following the move into the new facilities. There are no contingencies in the project budget for dealing with the current Town Hall building. Question: What was the estimated cost to renovate the current Town Hall? Imre Szauter responded that George Brodeur�s 2014 renovation estimate for Town Hall was about $1.6 million. George Brodeur added that the estimated cost to replicate Town Hall was about $3 million. Both reminded attendees that renovation or replication of Town Hall would do nothing to address the deficiencies with the fire department building or the current lease situation for the police department. Imre Szauter asked Allan Clark to present a brief project review, using the overhead conceptual drawing and three renderings produced by architect Peter Stewart. Allan Clark started by summarizing the reasons why the Committee recommended moving forward with a new project as opposed to renovating existing facilities. He pointed out that the energy inefficiencies of all three current buildings cannot be adequately addressed at a reasonable cost. Energy costs are a large drain on the operational budget of the town, and minor improvements in energy efficiency of the old buildings would not provide a good return on investment. Allan Clark also pointed out that modern, low-maintenance construction materials are another reason why new facilities would cost less in the long run. Renovating the existing buildings with modern construction materials would not realize their full benefit, as core components of the old structure such as the foundation, concrete slabs, walls and roof structures would remain in place. In the case of the fire department building, replacing the crumbling cinder block walls makes no sense, as new cinder block walls would still be energy inefficient. Allan Clark walked attendees through the highlights of the overhead conceptual drawing and the three renderings. He covered layout, traffic flow, utilities, septic system, and storm water runoff requirements. The reasons two buildings were recommended became clear as the Committee analyzed the specifications and determined it was more cost effective to construct the stricter code-compliant public safety building with a fire-suppression system separate from the town administrative functions, which must conform to less-strict fire- and life-safety codes. Allan Clark noted that energy efficiency plays a large role in reducing operational expenses in a new facility. While our three town buildings are using about $42,000 in fuel oil and electricity per year, which translates into about $2.71 per sq. ft., the Franconia Public Safety building uses the equivalent of about $1.00 per sq. ft. Question: What construction method is proposed for the new facilities? Allan Clark suggested that 2x6 wall construction with wooden roof trusses, as were used in the Franconia Public Safety building, would likely be used in this project. Rigid, spray and blown-in insulation would be used throughout the structure to insulate the slab, walls and ceiling from the elements. Question: Why were insulated concrete forms (ICFs) not considered for use in the buildings? Allan Clark responded that using ICFs would raise the cost of the project and not provide a much higher insulation (R) rating than 2x6 wall construction. Allan Clark presented his budget analysis and noted that it is all inclusive. While his current estimates include items such as new furniture throughout the facilities, cost savings may be achieved if some current furniture is moved into the new facilities. He mentioned that a more detailed analysis will be posted on the town website. Allan Clark stated that he is confident that estimating financing at 4% is very conservative, as the 2018 New Hampshire Municipal Bond Bank 20-year bond rate was just announced at 2.9%. Given that he has received estimated cost figures from three reputable construction management firms, he believes the $3.95 million total project cost is also conservative, and includes a $200,000 contingency to cover unforeseen expenses. Question: Will the new facilities be equipped with emergency back-up generators? Allan Clark replied that both the public safety building and the new Town Hall building would be equipped with propane-powered emergency back-up generators sufficiently sized to provide all necessary power during an outage. The cost of those generator systems has been included in the budget. Question: Is the cost of necessary security systems included in the budget? Allan Clark responded that those costs have been included in the Equipment & Furniture portion of the budget. Question: Does the budget include upgraded computer systems? Allan Clark replied that while upgrades for computers themselves are not included in the budget, all networking equipment and wiring are included. Computer system upgrades are handled by the town using funds from a capital reserve account specific for that purpose. Allan Clark presented his property tax implication information. Given the maximum gross cost of the project at $3.95 million, available funds from capital reserve accounts, grants and rebates are anticipated to reduce the actual borrowed amount to about $3.5 million. At a meeting with the USDA (US Dept. of Agriculture) in December 2017, he learned about the Northern Border Regional Commission (NBRC), a grant-making federal-state partnership that provides funds for projects in New Hampshire distressed counties. Allan Clark stated that he has reached out to the NBRC to learn about their programs and how much our project might qualify for; he estimated we would qualify for about $100,000. Allan Clark explained that using a twenty-year loan at a 4% interest rate, the annual cost for borrowing $3.5 million would be $254,512. Factoring in an anticipated energy savings of $20,000 and cancellation of the $22,000 lease payment for the police department building results in an annual savings of $42,000, thereby reducing the effective borrowed amount to $212,112. The anticipated impact on the tax rate would be about $0.65 per $1,000 valuation, meaning a property assessed at $100,000 would incur a tax increase of $65.00. With no further discussion on the budget or tax rate implications of the project, Imre Szauter invited Selectman David Scalley to discuss the town�s current tax rate and the impact that future events will have on it. 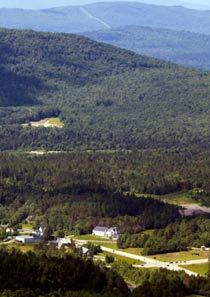 David Scalley stated that the White Mountain Regional School District has announced the closure of the Jefferson Elementary School in June, which will reduce the local education tax rate for Town of Carroll property owners by $0.35 per $1,000 valuation. However, there is an article on the school warrant that if passed, would increase the local education tax rate by $0.07 per $1,000 valuation, yielding a net reduction of $0.28 per $1,000 valuation for town residents. David Scalley pointed out that the town has two bonds maturing within the next six years. The water system project bond, at an annual cost of $49,461, matures in 2022 and the transfer station bond, at an annual cost of approximately $30,000, matures in 2024. When both bonds mature, the net impact on the town will be a debt obligation reduction of about $79,450 per year. David Scalley stated that our current tax rate is $19.68 per $1,000 valuation, of which only 22% ($4.26) is consumed by the town. The other 78% goes to the county, state education and local education. He stated the town has been very frugal and was able to reduce the municipal tax rate because of careful spending exercised by the town�s department heads and the Select Board. David Scalley offered that the town�s monthly payment for local education taxes exceeds what the project�s yearly cost would be. While voters have little control over the school budget, they can make an informed decision to support their own community by moving this project forward. Comment: We should not forget that the Town of Carroll is the only one out of five members of the White Mountain Regional School District that receives no state education funding assistance. In fairness, the Town of Lancaster took a huge hit in the new school fiscal year with the closure of the Jefferson Elementary School. David Scalley reminded attendees that this project will benefit town residents, businesses and guests to our area by potentially reducing emergency call response times, reducing our energy costs, and reducing our operational and maintenance costs for many years to come. David Scalley introduced the warrant article, stating it was quite lengthy due to the detailed nature of the project and its funding. He encouraged residents to read and understand it prior to the First (Deliberative) Session on February 6th and Second (Town Vote) Session on March 13th. He also asked attendees to help educate those residents who have questions or are unsure of the benefits of the project. Prior to opening the floor for questions and comments, Imre Szauter invited Allan Clark to provide a summary. Allan Clark complimented the Committee�s efforts and acknowledged the broad range of representation on the Committee. Following his hiring in May 2017, the Committee was expanded to include more citizens and business interests, and representation from the Bretton Woods community. He cited resident feedback and comments from the past three informational sessions as influential on the Committee�s thinking. Allan Clark stated that significant time was invested in identifying and analyzing the problem, namely antiquated, energy-inefficient, and non-compliant town facilities that have a direct impact on the quality and level of services provided by the town to its residents, businesses and visitors. Allan Clark pointed out that the solution recommended by the Committee and the Select Board is the best possible at this point in time, given that construction materials & labor costs and financing rates are sure to continue rising. Allan Clark cited the example of the Town of Litchfield�s $5.5 million proposal for a 10-bay fire department building, in contrast to our complete project budget of $3.95 million for new facilities for our police and fire departments and town administrative services, including a 150-person capacity community room. Allan Clark reminded attendees that as seen in other communities that have contemplated and completed similar projects, we should experience a growth in community pride that attracts new residents and businesses to the area. New facilities demonstrate that residents are willing to invest in their town and their future, and should create new opportunities for the younger generations that are currently leaving our area. Pride in new facilities may also translate into attracting additional police candidates and stimulate interest in increasing our fire department volunteer ranks. Allan Clark thanked attendees for their participation and offered to answer any questions. Committee member Michelle Palys asked to address attendees. She introduced herself as a resident and business owner. She stated that in order to make an informed decision about the project she joined the Committee and appreciates the way information is sought out, analyzed and communicated within the community. Michelle Palys spoke about how this project could stimulate new growth in town, which is vital to the future of the community, especially for the younger generations. The business community contributes significant property tax revenue and generates additional revenue for the community through the meals and rooms tax. She offered that business growth helps raise property values, broadens the tax base, and provides employment opportunities within the community. David Scalley mentioned a $60,000 warrant article, approved in 2017, provided the funding to create this plan to address the town�s current and future public safety, administrative and community needs. He stated that the Committee has worked very efficiently, as about 43% of the original $60,000 is still in the account. Committee member Bonnie Moroney stated that she has been involved with the Building Committee for over ten years and wanted to acknowledge its work over the last year to bring this project to the voters. She reminded attendees that previous attempts to provide new facilities carried a lower price tag, proving that delaying a decision only results in higher costs for future proposals. She encouraged residents to look beyond the bottom line and invest in the future of the town. With no additional questions or comments from attendees, Imre Szauter closed the informational session by again thanking everyone for attending and participating in the meeting. He mentioned that the presentation and Allan Clark�s supporting documents would be available soon on the town�s website, and reminded everyone of the February 6th First (Deliberative) Session at 6:30 p.m. in the fire department building and the March 13th Second (Town Vote) Session all day in Town Hall. The informational session adjourned at 8:55 p.m.
Minutes prepared by Imre Szauter.